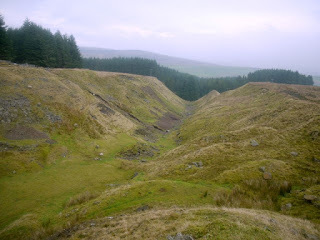 Cowhorse, or Cowhaust, Hush is a substantial manmade gash in the landscape above and to the south of the Killhope Lead Mine complex in Weardale. It measures some 3,000+ feet in length and is around 90 feet deep. The damage was caused by a crude method of mineral prospecting known as ‘hushing’. In this corner of the country, hushes were made as an environmentally unfriendly way to aid lead-mining. By the use of manmade channels (leats), water was collected behind dams and then released in an almighty torrent to wash away topsoil and loose rock to reveal the much sought after veins beneath the surface. Hushing was mainly an eighteenth century pastime, after which the landscape would be hand hewn with picks and shovels, aided by explosives where necessary. By around 1800 this method of gaining access to ore was not considered economically viable and underground mining became the norm. Awesome place i like that place . the neutral beauty of that place make it more attractive. thanks for sharing it. They used way too much explosives. This man made gash is pretty huge. They have done a lot.